SION(1 << 30): Software Input On Field. Force the selected mux mode input path no matter of MUX_MODE functionality. By default the input path is determined by functionality of the selected mux mode (regular). 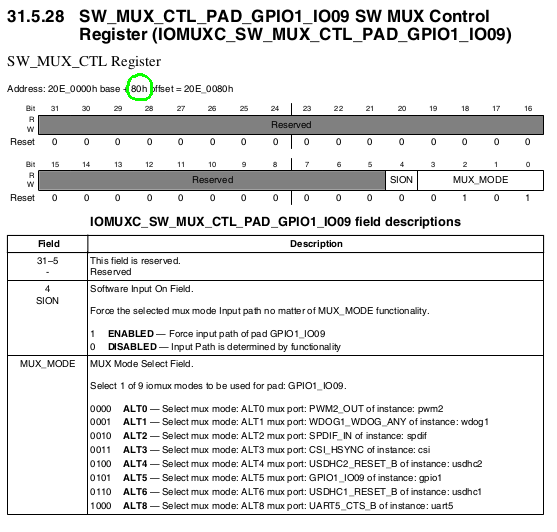 When we look at the SW_MUX_CTL register, we notice the SION bit is located at the bit 4 position. From this code, we can see that bit 30 is a virtual bit that gets translated into bit 4 in the mux mode register. Hope this helps in understanding how to configure the i.MX6UL gpio. Once you understand the details; the process is very simple.